Lava entering the Pacific Ocean where Kapoho Bay used to be. Seen on June 5, 2018. USGS/HVO. It almost sounds like the plot to a monster movie, but over the last few days, the lava flows from the Leilani Estates fissure eruption have eaten an entire bay (see above). 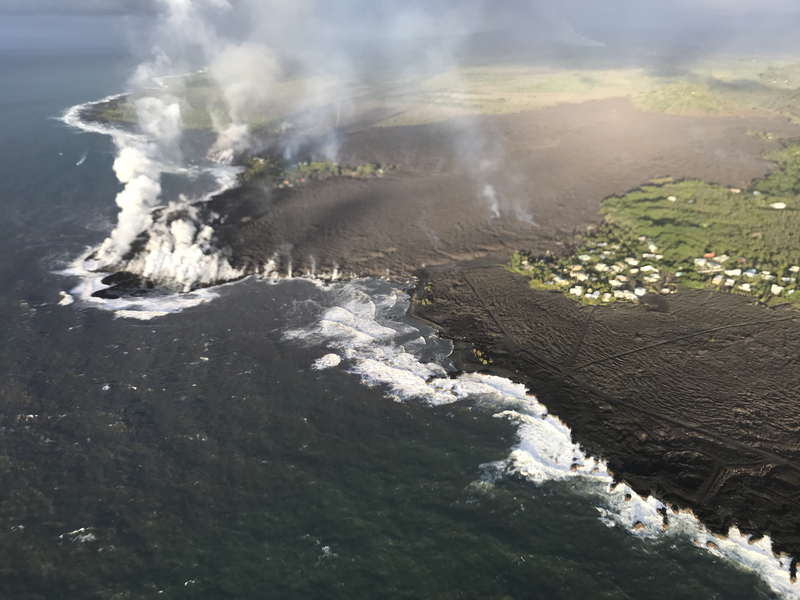 What was known as Kapoho Bay is no more as lava from Fissure 8 poured into the bay, covered tide pools and has now converted the whole area into a peninsula jutting out over a kilometer into the Pacific Ocean. In the process, these flows have destroyed hundreds of homes in the Vacationland Hawaii development that once circled Kapoho Bay. Check out this article on Motherboard about who might own these new lands in Hawaii as the flows move the coastline outwards. These same lava flows also filled and evaporated Green Lake, the largest lake on the island as well. Fissure 8 seems to be losing a little vigor (see below) as the lava fountain in the growing spatter cone is now reaching only ~40-50 meters (130-160 feet). 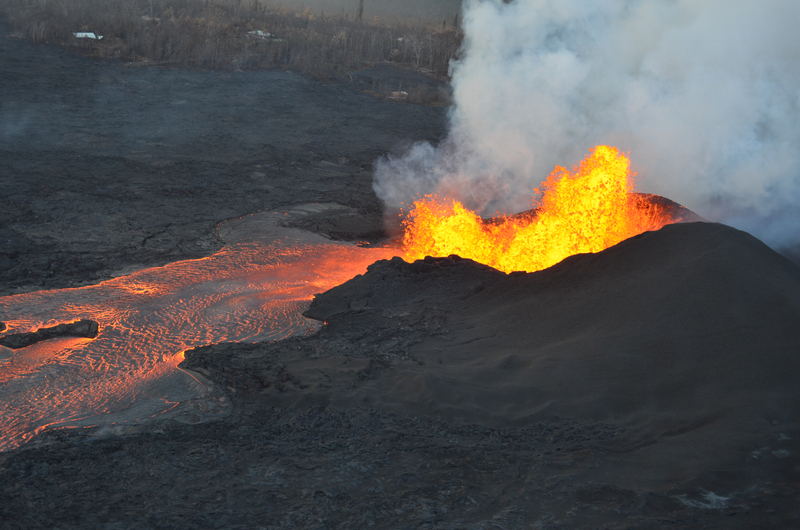 The fountaining at the new spatter cone on Fissure 8 with a pahoehoe lava flows extending out of the crater. Seen on June 5, 2018. USGS/HVO. This is the nature of eruptions at Kīlauea, where any eruption can dramatically change the shape of the coastline. However, even with these flows, only 0.2% of the Big Island (~20 km2, 7.7 sq. miles) has been covered by these new lava flows! It really puts it back into scale about both how big the island is with its 5 volcanoes and how large Kīlauea itself is when this activity is covering only a small part of the volcano. There have been some rumors running around the internet and Twitter lately about the eruption, namely that either the “blockage” at the summit vent that formerly held the lava lake will cause Mauna Loa to erupt and that Kīlauea is somehow becoming like Fuego in Guatemala because of the tiny bit of more silica-rich lava that erupted briefly early in the Leilani Estates eruption. Both of those rumors are false. 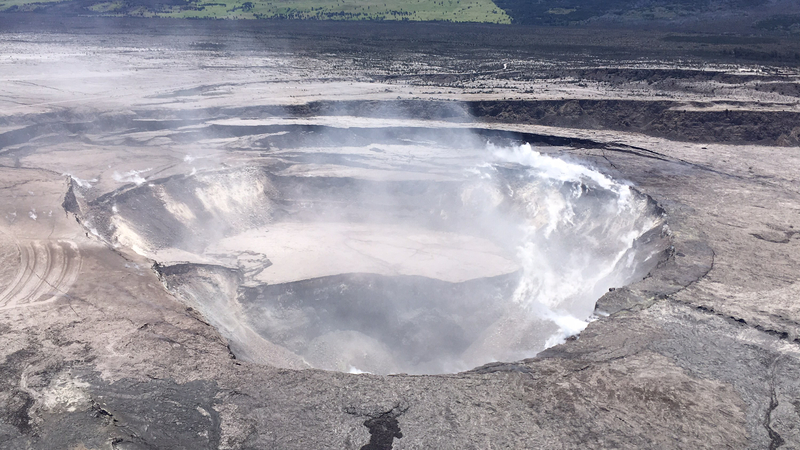 Mauna Loa and Kīlauea may be linked in the sense that their ultimate source is the Hawaiian hotspot under the island chain, but eruptions at Kīlauea are not going to “pressurize” the system to force Mauna Loa to erupt. Most of the magma that erupts at both volcanoes is stored in reservoirs that sit at ~5 kilometers depth while the source of the magma is 100 kilometers down. Mauna Loa and Kīlauea actually erupt distinct lavas in terms of their isotopic composition, suggesting again that although they might be both rooted in the hotspot, their magma do not interact after leaving the source. As for the idea that Kīlauea will become more explosive and behave like the deadly eruption of Fuego in Guatemala, that is cherrypicking at its finest. The tiny bit of higher silica basaltic andesite that erupted early in the eruption is the product of all this new basalt magma from the summit interacting with some older magma that was sitting in the East Rift Zone (like was sampled by the drilling at the Puna Geothermal Venture) or pushed out some older, more crystallized magma. However, since then, everything else has been basalt like Kīlauea normally erupts and the explosions at the summit are being caused by interactions with water not by changing magma composition. Halema’uma’u crater at Kīlauea’s summit with the enlarged pit crater seen in the foreground. Seen on June 5, 2018. USGS/HVO. An aerial image of the summit crater shows the expanded crater as well (see above). The Hawaiian Volcano Observatory now has a livestream pointing at the summit area so you can still watch the any changes or explosions up at Halema’uma’u. It’s erroneous isn’t it to expect expertise on a subject from a sampling that does not include the primary factors. Geochemistry relies on predictable values to resolve the pressure input…..given the exception…how will those substances react…no one knows!